Integrating food into skincare regimens is thought to add beneficial properties and also adds label appeal. Many foods are rich in vitamins, minerals, and antioxidants, and it is thought that by adding this to cold process soap, you are also adding these benefits. Additionally, adding natural and organic produce entices customers who are eco-conscience to buy your soap. 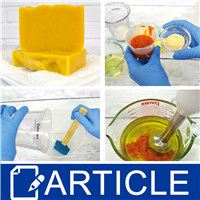 Formulate your cold process soap recipe with a soap calculator ensuring the hardness, lather, and cleansing properties are to your preference. Next, think about ingredients that will complement the food purée such as additives, colors, and fragrance. With the pictured carrot soap, we incorporated carrot powder and purple carrots fragrance oil to complement the carrot purée. The puréed food will replace some of the water in your formula. You can use one ounce of puréed food per pound of soap as a starting point and can add as much as one half of the total water amount in your formula. Our initial formula called for 5.32 oz. of water. We decided on 2 oz. pureed carrots so we discounted the water amount to 3.32 oz. Normally the food puree is added to the oil phase, but in certain circumstances it can be added to the lye water. Food that is high in sugar content has a tendency to burn in lye water so we recommend always adding sugar rich foods to the oil phase.